A Tribute to President Obama and a Musical Account of the Conservative Right Wing Hate Movement’s Unprecedented Attacks Against America’s First African American President. Introducing the CD that says the things that President Obama could not say while in office about the motivation behind many of the unwarranted, unjustified and vicious attacks against him, his family and his supporters. 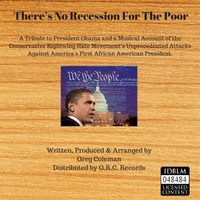 There’s No Recession For The Poor By Greg Coleman is a Tribute to President Obama and a Musical Account of the Conservative Right Wing Hate Movement’s Unprecedented Attacks Against America’s First African American President. For many years, a majority of Americans thought that most of the Racial Hatred and Division in this country’s 238 year old history had become a thing of the past, and ceased to exist to any degree that would give cause for alarm or panic. This falsehood was socially acceptable as fact prior to November 4, 2008. Between 2006 and 2007, rumors of a young African American Jr. Senator from Illinois, by the name of Barack Obama, began to circulate throughout the country. Rumor had it that he was being groomed as a potential Democratic Presidential Candidate. These rumors began stirring and reheating a pot that had never been completely turned off, but that was left quietly simmering on America’s Back Burner. On November 4, 2008, those false assumptions came to a screeching halt when Senator Obama became the First African American President of the United States of America. At that point, the pot began to boil over and spill out into the streets of many cities and towns where Racism was still prevalent and never ceased to exist, but that was for the most part, reduced to an outside, underground movement that had been neutralized as a result of Federal, State and Local Laws that were enacted to protect the Rights and Freedoms of people,( who these people), considered to be inferior to them and not worthy of the same Freedom, Justice and Equality that they were entitled to under the law. These Hate Movements were also neutralized by the Natural Evolution of the Human Species towards becoming better human beings, aspiring to be more considerate, tolerant and respectful of others,( even though they may be different). One of the most notable hate groups during this time was the Tea Party; which was cooped by New York Billionaire Donald J. Trump. They helped him to create “The Birther Movement”, which was one of many attempts by The Right to delegitimize this president. On November 6, 2012, after a very tumultuous, divisive and chaotic first term for President Obama; all hell broke loose again, when the Rightwing conservative Hate Machine failed in their attempts to make President Obama a “One Term President”. He was reelected to a second term; and the intensity and number of Hate Groups that sprang up when he was first elected continued to escalate to levels that had the potential of creating another Civil War in this country like the one fought from. April 12, 1861–May 9, 1865. For most people, these acts of Racial Hatred ended the illusion of “A Post Racial Society”, which many people thought America had finally become just because of the Election of the First African American President. It simply was not true then and it is definitely not true now that Donald Trump a Democrat, conveniently changed his Political Stripes to Republican, in order to coop these hate groups to help propel him to President Trump with all his Hateful, Racist, Sexist and Dangerous Rhetoric in combination with a Cult Like Following of people who do not care about or recognize how Selfish, Greedy and Dangerous this Pathological Liar is for America and the world. The election and reelection of President Obama awakened and exposed the sleeping giant in this country known as Racism. He successfully completed both of his terms as President against Unprecedented; Fierce Opposition like no other president has had to face in this country’s history before, because no other Official President in this country’s history had been Black before. But in spite of all the negativity and hate directed at him and his family, he did manage to bring the country back from the economic collapse left behind by the previous Republican Administration, save the auto industry and provide healthcare to millions of Americans who previously did not have it; in addition to a number of other Historical International Accomplishments. He also managed to create a Spirit of Unity, Cooperation and Tolerance of others among most reasonably sane Americans. His Presidency like the white ones who came before him was not perfect. However, in view of what he did accomplish in such a Hostile, Racist Political Environment, I think that his legacy should not be tarnished by Hatred, Racism and Lies. And I can’t help but think how much better this country would be right now if Congress had tried to work with him, rather than trying to destroy his Presidency and his Legacy; ( while lying about him not trying to work with them). And in the face of all the Hatred that he and his family had to face while trying to effectively govern this nation for all of its citizens, they dealt with these attacks and sabotage with Style, Class, Dignity and Respect. There’s No Recession For the Poor is my individual contribution to protecting President Obama’s legacy by musically paying tribute to the 44th President by countering the continued attempts of America’s Right Wing Hate Machine to destroy it. Join the movement to protect President Obama’s Legacy now and forever. Get your copy of “There’s No Recession for the Poor” today. Greg Coleman is a Guitarist, Vocalist, Writer, Producer, Arranger, Performer, Entrepreneur and Social Activist who believes that without access to GOD’s Master Plan; the only explanation that he can come up with for our existence is to help, (not hurt), each other as best we can while we are alive. A testament to the survival and progress made by victims of evil thoughts, practices and deeds that continues to be inflicted upon oppressed people throughout America and the World by those who are in positions of power that allow them to oppress certain Ethnic, Racial and Social Classes of people such as, Native Americans, African Americans, Jewish Americans, Japanese Americans, and Poor and Disadvantaged People, etc. ; who they deem to be Inferior and not worthy of the Equality that they themselves experience as citizens of the United States of America; and how eventually this evil is defeated through Resistance. Although I agree with Conservatives that Personal Responsibility and Individual Effort is absolutely necessary for success in this country; I also have to argue that due to Societal and Structural Inconsistencies coupled with other factors such as Skin Color and where and how you start in life means that all personal responsibility and individual effort is not created equal. The good thing about this movement was the fact that they were Non-Partisan and did not favor any one political party over another. They were fighting against everything that they saw that was wrong with this System of Government regardless of party. Because, there are some things terribly wrong with this country that need to be recognized, acknowledged and addressed in an open and honest manner on an ongoing basis. In 2010, the Conservative Pac Citizens United won a Pivotal Supreme Court Case that allowed Political Campaigns to receive Dark Money, (money that comes from unknown sources in unknown quantities). In effect, it allowed Millionaires, Billionaires and Mega Corporations to buy elections by drowning out the will and voices of the people by spending excessive amounts of money on Smear and Sabotage Campaigns against Progressive Candidates and Causes by utilizing Excessive Negative Advertising against these candidates. However, I believe we are now seeing the long term effects of this ruling with the election of Donald Trump as President over Secretary of State Hillary Clinton who won almost 3 million more popular votes than Trump. Right now we are in a Dark Cycle that in time will be reversed by the Power and Unity of those interested in cultivating the Better Angels of our Human Nature.